You and your love story are unique and special. Tailor made bespoke designs printed on lush paper sets the tone for your big day. We start with a private consultation session to get a better understanding of your vision. A draft design will be delivered upon confirmation of services and we'll work with you at every stage, from amendments to the final print keeping you involved in each and every detail of your big day. Designed with you in mind. Melbourne based, available worldwide. Get in touch for more ! Email joanna@quirkybydesign.com.au, we'd love to hear from you. One of a kind unique His and Her vow books, a special keepsake from the most special day of your story. Classic black and white, illustrated, or shimmery hand torn placecards, the possibilities are endless for weddings or to add a touch of bespoke luxury to your event. 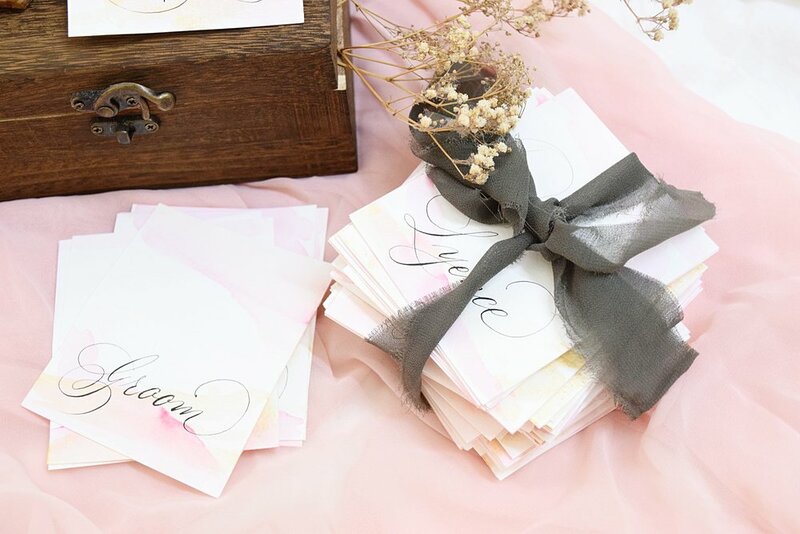 Hand calligraphed envelope addressing in a variety of styles for the most luxurious personalised touch, a memorable first impression for your guests. Your dreams and vision translated into paper love stories. Set the tone of your wedding with bespoke invites that reflect who you truly are.